If you have several hard disks, select a folder on a different hard disk than the one you use for SL viewer cache. Choose a hotkey to capture the video. F5 for instance. Select 30 fps for NTSC, 25 for PAL. Check it if the folder you choose is on a FAT32 hard disk only. Check “Record Win7 sound” to record sound from SL. Check it for machinima, left uncheck for tutorials. Let it checked to prevent extra unneeded computation. You will need to add two useful tools to firestorm viewer. Phototools and camera tools. Right click on any toolbar button. Drag phototools and phototools camera buttons to the toolbar. You can also open Phototools using Alt + P, and Cameratools using Shift + Ctrl + C.
SL viewer should be sized very precisely to suits the future video size. Ctrl+Alt+D to add Advanced menu if you don’t have it yet. If Ctrl+Alt+F1 is not working on a windows 8 system. Right click on the Desktop / Graphics properties / Advanced mode / Ok / Options and Support / Uncheck box Enable. 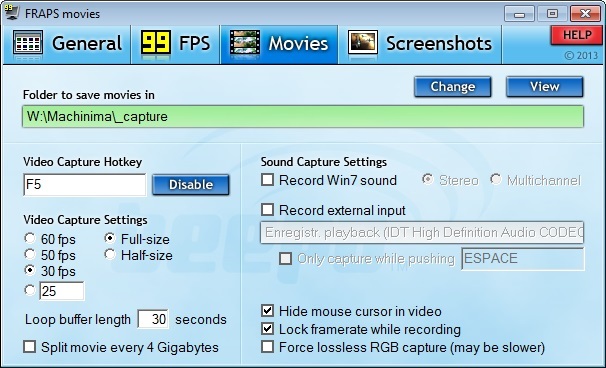 Video recording software like fraps creates files with very long name. Those names are hard to deal with within the video editor. You can use software tool like Renamer to shorten them.